The City of Cedar Hills actively promotes water conservation. We encourage our residents to learn all they can about this important topic. Read information on the Utah Division of Water Resources Website about watering, mowing, and fertilizing your lawn specific to North-Central Utah. Generally, one irrigation is equal to 0.5 inches of applied water, which is roughly equal to 20 minutes per station with pop-up spray heads and 40 minutes per station with impact rotor sprinklers. The City’s Public Works department continues to manage park maintenance while following water conservation guidelines. Learn more on the Cedar Hills Park Master Plan. CEDAR HILLS –The City of Cedar Hills will continue to implement outdoor watering restrictions for all residential water users within the city. The restrictions regulate proper water management, regardless of drought levels. According to the Division of Natural Resources, even with watering restrictions, most people use twice as much water as their lawns need. This policy is in effect from April 15 to October 15, 2018. All house numbers ending in odd numbers will be allowed to water Monday, Wednesday, and Friday. All house numbers ending in even numbers will be allowed to water Tuesday, Thursday, and Saturday. Additionally, spot watering with a hose is allowed on Sundays. Restrictions will be enforced with a warning for the first violation, a $50 fine for the second violation, and a $200 fine for the third and subsequent violations. Commercial, church, park, and golf properties may be on different schedules, including daytime watering, to offset water demand. The city encourages residential properties to follow the water conservation recommendations of the State of Utah, such as not watering during the hours of 10:00 a.m. and 6:00 p.m. In addition, residential landscape irrigation plans should be evaluated throughout the watering season to account for cooler temperatures in May and September, changing weather conditions, varying soil types, plant materials, maturity of lawn and landscaping, and reviewing the necessary steps for achieving a healthy lawn. 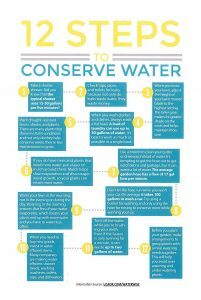 We appreciate the continued efforts of residents in helping the city conserve water resources and promote water conservation. CUWCD offers a $100 rebate on the purchase of an EPA WaterSense® labeled smart controller, which helps reduce water waste by using local weather and landscape conditions to apply water to landscapes only when needed. CUWCD believes that appropriate equipment can make a difference in landscape watering efficiency, if it is installed and then used correctly. Homeowners within the District who will take the necessary steps to purchase and use equipment that has been shown to reduce water use are eligible for assistance through rebates and small grants. Visit rebates.cuwcd.com for downloadable forms and a list of eligible products. A smart controller can only be as smart as the system it’s connected to, and CUWCD encourages you to regularly monitor and properly maintain your sprinkler system. The city welcomes your questions regarding the pressurized irrigation system and water conservation. We have had a number of residents contact the city about low water pressure on their pressurized irrigation connection. Each connection should include a filter, which would have been installed at the time that sprinklers were attached to the city-wide system. These filters must be cleaned a couple of times each year to ensure full flow to the system. If you are having concerns with low pressure, try cleaning the filter and re-evaluating the flow. For instructions on finding the valve and filter, click here. Unfortunately, free slow-the-flow water checks are no longer offered in Utah County, but the Slow the Flow website is an excellent resource for lawn watering guides specific to northern Utah, indoor and outdoor water use tips, and a place to support water conservation in Utah by taking the H2oath, Utah’s water-wise pledge! 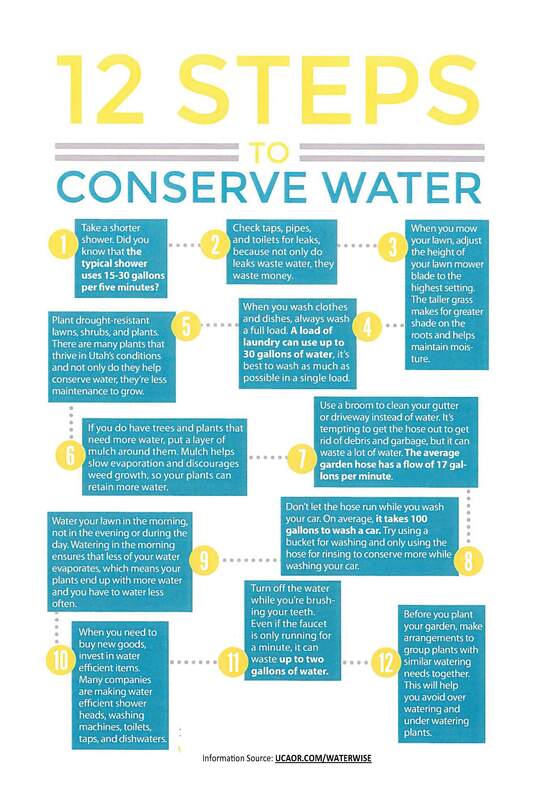 Did you know you may be using more water than you realize? To estimate the total gallons used outside your home per month, use this simple equation: Watering minutes per day (X) Watering days per week (=) Watering minutes per week (/) 60 (=) Watering hours per week (X) 250 (=) Gallons per week. To estimate your average outside usage per month, multiply this answer by four. Frequently check your irrigation system for leaks. Use low water-use plants and shrubs. Adjust irrigation schedules to accommodate seasonal water demands. When there are cooler temperatures and precipitation, suspend your automated sprinkler system until conditions warrant resuming a sensible watering schedule. Adjust sprinkler so only the lawn is watered and not the house, sidewalk, or street. Water at night or during the cool morning hours to minimize evaporation. When you mow the lawn adjust the height of the mower blade to the highest setting or a minimum of four inches. The taller grass makes for greater shade on the roots and helps maintain moisture. Plant drought-resistant lawns, shrubs, and plants. There are many plants that thrive in Utah’s conditions. Not only do they help conserve water, they require less maintenance. If you do have trees and plants that need more water, put a layer of mulch around them to discourage weed growth and help slow evaporation. Before planting the garden, plan to group plants with similar watering needs together to help avoid over watering and under watering the plants. Take a shorter shower. A typical shower uses 15-30 gallons every five minutes. Check taps, pipes, and toilets for leaks. When you wash clothes and dishes, always wash full loads. It’s tempting to get the hose out to get rid of debris and garbage, but it can waste a lot of water. Use a broom to clean gutters and driveways. The average garden hose has a flow of 17 gallons per minute. When you need to buy new goods, invest in water-efficient items. Many companies are making water-efficient shower heads, washing machines, toilets, taps, and dishwashers. Turn off the water while brushing your teeth. The bathroom faucet can run up to two gallons of water in one minute. Do not let the hose run while washing your car. Instead, use a bucket or use a hand sprinkler with an on/off lever attached to your hose. Sweep your sidewalk and driveway rather than hosing it off. Brown Spot…It must need more water. Or does it? Did you know that not all brown spots are caused by lack of water? Some spots are actually caused by a grass root-eating bug called bill bug. This bug will eat the root of the grass, causing areas of your lawn to turn brown and look as if it is not receiving enough water. So how does one tell if they have bill bug? Pull a sample from the “dead” grass area; if roots are non-existent and/or they look chewed on, you’ve got bill bug. So before you hose, check for evidence of the bug, because no amount of water is going to bring your beautiful landscaped yard back if the bug is prevalent. Grass not healthy enough for you? Try aerating your lawn. Grass, like people, needs oxygen to grow. Regardless of how much water you give your lawn, it will never reach that beautiful lush green color without oxygen. So oxygenate, and start aerating every spring. Not only will this make your lawn more green and beautiful, but it will make it healthier and more durable over time. The Utah Department of Environmental Quality is asking for Utahns to scale back on how frequently lawns are being watered. Lower temperatures in September reduce the need for watering to approximately once per week. Adjust your individual sprinkler system and make it a habit to follow recommended watering requirements based on temperature, precipitation, type of soil, etc. The State is striving to lower per capita water use by at least 25% by 2050. View the KSL News article. At the city’s town hall meeting on August 14, 2014, Richard M. Noble, the managing principal engineer with Hansen, Allen & Luce Engineers, presented a capacity assessment of the pressurized irrigation system. Click here to read the presentation. In addition to the presentation, which discussed the history of the pressurized irrigation system, including weekly and annual trends, there was a discussion about water conservation and what the city is doing to conserve irrigation water, followed by a question and answer session. Watch the entire August 14 town hall meeting on YouTube. The city monitors water consumption within each pressure zone every week and is able to calculate a city-wide usage of the secondary water. The water-ometer shows the city’s current usage and compares it to the state’s recommended usage. Keep in mind that the city does not include the golf course in its weekly reporting of irrigation use, nor Heritage Park, which is on culinary water, not pressurized irrigation.